Looking for Preschools in Gilbert AZ? A Child’s Place at The Ranches has always been proud to offer very competitive rates for your child care needs. We offer several rate and schedule options. 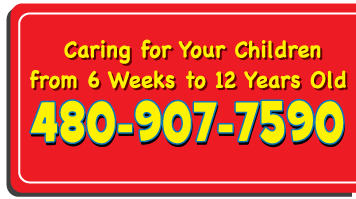 Please call us to discuss which rate and schedule best fits your family’s needs for preschools in Gilbert AZ. We follow Innovations: The Comprehensive Infant Curriculum. This is a program that focuses on developmental tasks, observations, assessment, interactive experiences, parent participation and involvement, and experiences. Our infants get tummy time, music and movement, and lots of love and attention. We follow Innovations: The Comprehensive Toddler Curriculum. This program focuses on hands on learning and experiences in a nurturing environment. While we continue on with developmental tasks, observations, assessments, interactive experiences, and parent participation and involvement, these children are learning some independence. They start to form relationships with other children and developing language, cognitive, and motor skills. They enhance these skills through group time, music and movement, art, and lots of fun activities. We work with the parents to assist in potty training when the child is ready. At this age, we continue with Innovations: The Comprehensive Preschool Curriculum. Through prop boxes, imagery play, and home living, the preschoolers learn to use their imagination while learning compromise, sharing, math, science, and developing relationships. They continue with group time activities, as well as learning individual activities and play. They continue to grow their motor and language skills through music and movement. More hands-on learning and doing helps development a sense of independence and self-confidence. Having fun and being creative, they learn their ABCs, numbers, shapes, colors, and much more. DES approved. Please contact us directly for more information on DES rates.